Public sector helping pay for project, so jobs should be local, high paying, workers argue. Photo by Joel Angel Juarez. 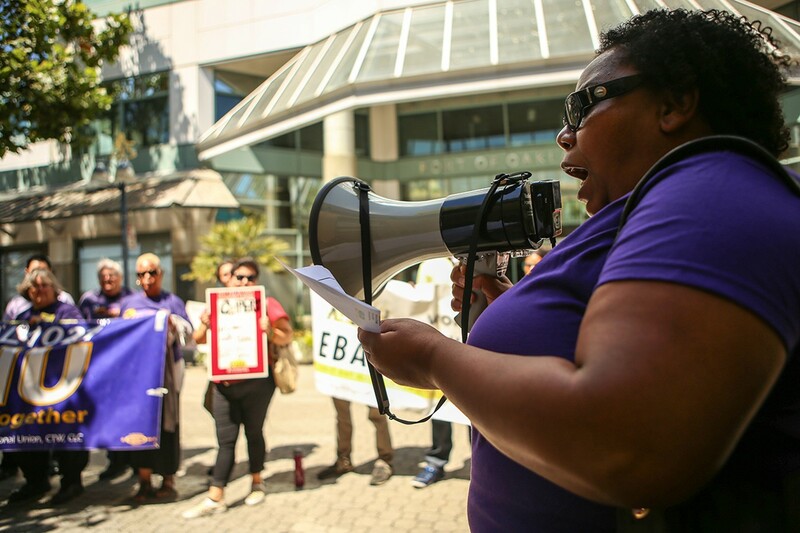 Kim Moses, president of SEIU 1021's port chapter, speaks at a rally outside the Port of Oakland headquarters last week. Longtime West Oakland resident Shirley Burnell used to work at the Army base, and she remembers it as a hive of economic activity. It employed hundreds of nearby residents and hired local businesses as contractors. It pumped millions of dollars into the East Bay. And, at its height, it was part of the economic bedrock upon which Black West Oakland built its prosperity. "Back then, West Oakland was bustling," Burnell recalled. "There were shops everywhere, people were working, and jobs were everywhere to be had." Today, residents hope negotiations over a giant industrial-warehouse project, which is planned for construction at the Port of Oakland, will help West Oakland return these glory days. But the talks are entering their eleventh hour, and the labor unions and community groups that consist of the Revive Oakland coalition still haven't struck a deal with the Port and its developer, CenterPoint Properties. At stake are hundreds of jobs building and operating giant warehouses, which will be used to shift cargo between the ships, trucks, and trains bound for distant markets. Revive Oakland wants an agreement to ensure these new gigs go to locals and the formerly incarcerated, and that they're paid living wages. The project is part of a larger redevelopment of the former Oakland Army Base, half of which was handed to the Port when it was decommissioned years ago. Burnell described how the base's shuttering hit West Oakland hard. The neighborhood was already suffering from decades of disinvestment, rising crime, and high rates of poverty and unemployment. When the base was decommissioned, an increasingly automated Port began spewing additional toxic fumes into the air. Meanwhile, large numbers of Oaklanders were arrested and incarcerated due to enforcement of draconian drug laws. Their criminal records made it even more difficult to find work when they got out of prison. Today, a lot of the new jobs being created in Oakland pay low-wages, Burnell says. But the construction and warehouse jobs at the new Port complex could pay a living wage and allow workers to stay in the community. 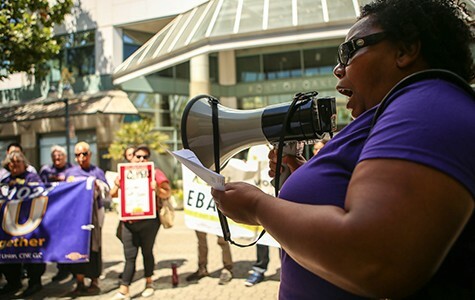 Jahmese Myres, an organizer with EBASE and a member of the Revive Oakland coalition, said her group is asking the Port and CenterPoint to sign a "ban-the-box" pledge, which would mean that formerly incarcerated people could apply for jobs without fear that their records will disqualify them. They're also asking for a local-hire commitment, which would guarantee jobs for workers who live in Oakland's economically depressed flatlands adjacent to the Port. And they want to eliminate the use of temporary workers, or at least minimize this practice as much as possible, for the warehouse jobs, so that workers have stable, full-time employment. Myres said the warehouse industry often exploits laborers as temps, hiring and firing them at will, and reducing medical and other benefits. According to Myres, the City of Oakland and another developer struck a similar community benefits deal with West Oakland neighborhood groups years ago when to develop the other half of the Army Base. "The Port has promised at bare minimum they'd do as good as the city side," Myres said. CenterPoint didn't respond to emails and phone calls to discuss the negotiations, however, and it's unclear whether the company will agree to these proposals. According to several sources, talks between the company and Revive Oakland haven't been as productive as many hoped. Representatives with Revive Oakland said they had no draft agreement to share publicly yet, but they're hoping CenterPoint will continue talks with them before September, when the Port and the developer are expected to sign a final development agreement. Mike Zampa of the Port of Oakland said its goals align with those of the community, and that he's confident a mutual and beneficial agreement will be reached. He pointed to the Maritime-Aviation Project Labor Agreement, signed in 2000, which set ambitious local hiring goals as part of a billion-dollar reinvestment in the Port's infrastructure. The MAPLA was one of the first so-called community-benefits agreements in the nation, setting the precedent that large-scale developments on public lands, using public funds, would be tied to specific goals to improve the lives of nearby residents. "We take pride in it," Zampa said. "We exist really for several reasons. One primary reason is to create good jobs in Oakland and make opportunities for local small businesses." The specific MAPLA goal was to reserve 50 percent of all job hours for residents of Oakland, Emeryville, San Leandro, and Alameda. According to the most recent MAPLA progress report, the Port achieved 30 percent, resulting in millions in wages paid to local area residents. Zampa called CenterPoint a "premium quality" partner. "These guys have hundreds of thousands square feet of warehouse space across the county. You couldn't do better than them. They're the Cadillac." Outside the Port's headquarters in Jack London Square last week, John Jones led two dozen Revive Oakland members in chants of "public land, public good!" Workers and neighbors held up signs reading "support a people's port." Jones, who was born and raised in Oakland, did time in a Washington State prison, but now works as a community organizer and youth counselor. "Why are we penalizing people who want to work?" he asked about the prevailing policy when it comes to hiring. According to California's Department of Corrections and Rehabilitation, Oakland has a large and dense population of parolees, many of them residing in flatland neighborhoods of East and West Oakland adjacent to the Port. Similarly, Oakland is home to the largest population of people on probation among all Alameda County cities, at 41 percent. Their criminal records may be part of the reason the unemployment rate is so much higher than other parts of the state. Several Port workers said that CenterPoint should return to the table and strike a deal with Revive Oakland on good jobs, because all of the money the company will use to build the warehouse project comes out of their pensions. CenterPoint is owned by the state pension fund CalPERS, which took the company private in 2005, one of several big bets the pension system made on real estate. "I'd like my pension to be used for the good of the people of Oakland," said Kristen Loomis, a West Oakland resident and retired SEIU 1021 member, who attended the Port's board meeting last week. Spokesman Joe DeAnda told the Express that CalPERS has a responsible contractor program that "supports and encourages fair wages and benefits for workers employed by contractors and subcontractors working on our behalf through our external investment managers." DeAnda said that CenterPoint's project would be subject to the program, but referred further questions to CenterPoint and GI Partners, a Menlo Park-based private equity firm that manages the company for CalPERS. A review of CalPERS' responsible-contractors policy shows that it doesn't include a ban-the-box provision, temp-worker restrictions, or the local-hire requirement sought by Revive Oakland. Kimberly Moses, a Port worker and chapter president for SEIU 1021, said a good-jobs agreement should be mandatory, due to the use of public funds, including the pension system's assets. "They only have the ability to do this because of the money that the public sector pours in," she said. "They have a fiduciary responsibility to be engaged in business ventures that aren't exploitative."